The Teenage Mutant Ninja Turtles (also known as TMNT and Ninja Turtles) are a group of fictional characters that first appeared in comic books. Created by Kevin Eastman and Peter Laird, the Teenage Mutant Ninja Turtles debuted in the comic book, Teenage Mutant Ninja Turtles #1 (cover dated: May 1984), which was published by Eastman and Laird's Mirage Studios. The Ninja Turtles are teenage anthropomorphic turtles, meaning they walk and talk like humans. Each turtle is named for an Italian Renaissance artist: Donatello, Leonardo, Michelangelo, and Raphael. The Turtles were adopted by an anthropomorphic rat, Splinter, who was their sensei and who trained them in the art of ninjutsu. The Turtles live in the sewers of New York City and battle every bad guy from petty criminals and overlord-mastermind types to alien invaders and mutated creatures. Marvel and DC Comics no longer publish comic books featuring both their characters uniting for adventure and battle. However, over the past several years, DC and IDW Publishing have published cross over comic books that featured DC's characters playing with characters for which IDW has the license to publish comics. An example is the recent comic book miniseries that brought the worlds of Star Trek and Green Lantern together. The two publishers have come together again for Batman/Teenage Mutant Ninja Turtles, a six-issue miniseries written by James Tynion IV; drawn by Freddie E. Williams II; colored by Jeremy Colwell; and lettered by Tom Napolitano. 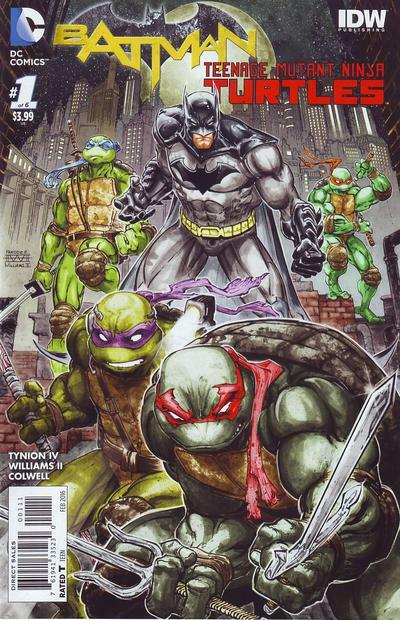 Batman/Teenage Mutant Ninja Turtles #1 (“Knights in a Half Shell”) finds Gotham in the midst of a strange crime wave. Several research labs have been attacked, and the only things the intruders have stolen is experimental military-grade technology. Witness claim that the attackers are monsters, something like “turtles.” Batman's own investigation leads him to believe that some of the attackers are trained in ninjutsu. Batman and those witnesses are closer to the truth than they imagine. I wanted to be cynical about the first issue of Batman/Teenage Mutant Ninja Turtles, but I can't. I had thought that this crossover comic book would be silly, but instead, it's simply fun to read. Thanks to the art of Freddie E. Williams II, Batman/Teenage Mutant Ninja Turtles #1 looks like the early TMNT comic books that Mirage Studios published back in the mid-1980s. Williams presents a Batman that looks like the Dark Knight of DC's “The New 52,” but he also looks like he belongs in the funky world of TMNT. Stylistically, Batman and TMNT don't seem strange together. Writer James Tynion IV makes every word count, moving the story forward and whetting our appetites for more. He seems dead serious about taking this miniseries seriously, but that doesn't mean he does not realize how much fun it is in bringing Batman and the Ninja Turtles together. This is a good, old-fashioned fun-to-read comic book. Did I mention fun? As I write this, the second issue of Batman/Teenage Mutant Ninja Turtles is available, and I'm ready for it.